Today we honor the birth of civil rights leader Rev. Dr. Martin Luther King, Jr and acknowledge the efforts made by him and others to dismantle the stultifying apartheid system in America, a system that placed severe restrictions not only on the physical and political freedom of black people, but also on intellectual freedom. The Jim Crow south not only meant separate drinking fountains and restrooms. It also meant separate libraries and books. Laws and local policies also placed restrictions on what could be disseminated and published. Dr. King–as well as those who worked to build libraries and ensure that they be free to use–operated within this system and sought to get rid of this system. As a young person, Dr. King was an avid library user according to a new book published by Louisiana State University Press called The Desegregation of Public Libraries in the Jim Crow South: Civil Rights and Local Activism written by Wayne and Shirley Wiegand. At the Auburn Avenue branch library in Atlanta, the young Martin read works on Mahatma Gandhi’s nonviolent resistance to oppressive power regimes. Librarian Annie Watters procured the books that King liked to read as part of a special discussion group she started in 1934. Such Gandhian nonviolent approaches that Dr. King fostered included sit-ins, bus boycotts, and marches and while he “seldom participated in demonstrations or sit-ins involving the desegregation of public libraries,” (pg. 15) many young African American library users did, which The Desegregation of Public Libraries in the Jim Crow South details. Through the stories of these young organizers and demonstrators, Wayne and Shirley Wiegand show aspects of the greater civil rights struggle. Branch libraries like Atlanta’s Auburn Avenue came into existence on the part of both black and white librarians in the south to ensure library services to black residents as the public library movement progressed across the country in the early twentieth century through the Carnegie grant program. The effort to build and maintain these branches was a masterful feat that required a particular skill set amongst librarians. Not only did apartheid in the American south require separate library facilities for white people and black people, the books had to be kept separate as well. Collections within public library systems that had branches serving black neighborhoods could not mix with books used by white neighborhoods. The Wiegands tell the story of one librarian who had to add a small triangle symbol to the spine of the books in her branch collection in order to assuage concerns amongst the local white population about potential book intermingling. The work involved to desegregate both the library building and the collection required federal legal action and local demonstrations. The Wiegands describe how two public library systems in Mississippi quietly integrated black branches after the 1964 Civil Rights Act passed. The authors also include details on a not-so-quiet sit-in demonstration at the Jackson Public Library by the NAACP Youth Council to ensure integration (see pg. 148). The cover of the book shows a historic photograph from NAACP records of a young black library user surrounded by white police officers while sitting and reading with pencil in hand at a library table. Recognizing Martin Luther King Jr Day brings into perspective not only Dr. King’s contribution to ensuring freedom and equality but also the many and complex ways in which basic freedoms can be curtailed. I found it eye-opening to read about how the freedom to read and have access to good information has to be actively pursued. While we celebrate Martin Luther King Day, this post is also in honor of the librarians and young activists who made such efforts. 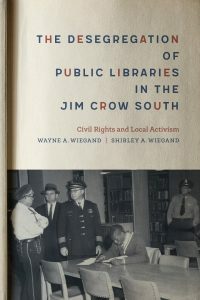 If you’re reading this and happen to live in or near Columbus, Georgia, Wayne Wiegand (co-author of The Desegregation of Public Libraries In the Jim Crow South: Civil Rights and Local Activism) will give a presentation at the Columbus Public Library on February 6, 2019. The protestors that participated in demonstrations and sit-ins will be in attendance. Allyson Mower, MA, MLIS is Head of Scholarly Communication & Copyright at the University of Utah Marriott Library. She’s very curious about curiosity, what drives people to uncover information, and how libraries of all types create demand for knowledge. As a tenured faculty member, she researches the history of academic freedom — a kind of intellectual freedom — and the history of authorship and scholarly communication at the institution. She provides the U of U community and the general public with information, tools, and services related to both copyright and publishing. 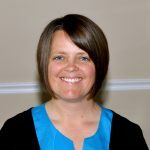 Allyson was a Library Journal Mover & Shaker in 2008, was nominated as a 2012 Society for Scholarly Publishing Emerging Leader, and served as the U of U Academic Senate President in 2014. Find her on Twitter @allysonmower. I am looking forward to reading this book. Generations of Americans have received part of their education in public libraries; African-Americans were systematically excluded from this experience in the Jim Crow south. In “This Promise of Change,” a new book for young readers by Jo Ann Allen Boyce and Debbie Levy, the authors recount Allen Boyce’s participation in the desegregation of Clinton, Tennessee’s public high school in 1956. They describe how the public library also barred people of color, another cruel and damaging part of life for Allen Boyce’s community. I recommend this book highly to educators, as well as to parents and caregivers. It will help students to learn about the history which you recall for adults in your post. Thank you. Hi Emily–thanks for the comment and for mentioning Boyce and Levy’s book.